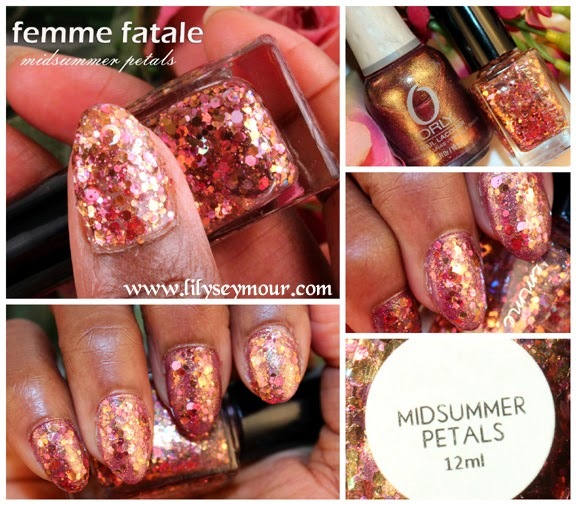 I've been wanting a pink glitter nail polish for quite some time now particularly this nail polish from Femme Fatale which is strictly an Australian brand. Austrralian's are funny when it comes to customs and what can and cannot ship to and from their country. This particularly applies to nail polishes and due to certain custom regulations on nail polishes, they can not ship to the US. On the Femme Fatale website, they list partners in other countries that carry all their polishes so we have the option to buy directly from their partners. I bought six polishes which I wrote about here. For my base, I used one coat of Orly Ingunue nail polish which is a very beautiful monochrome polish with a mixture of raspberry, gold and purple. Then I applied two coats of the Midsummer Petals. This polish has a mixture of large chunky glitters that are pink, raspberry, purple, gold, red and silver with a rose gold base. I played around with the lighting on my camera so some of the photos appear lighter than others. All in all, this is one of my favorite polishes by far and I will certainly have to order a backup of this one!